There are few who do not remember the first time they saw or met the person with whom they eventually fell in love and then made the decision to become life partners. Shopping and buying a new home evokes the same kind of emotions—memories that will last a lifetime. 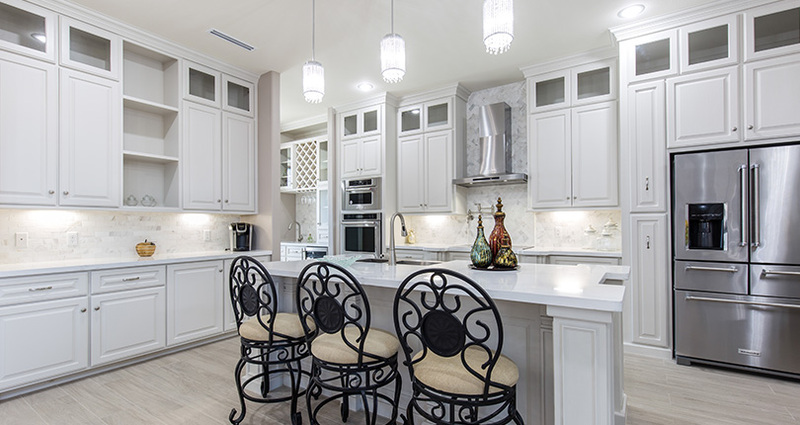 Every year, the Rio Grande Valley Builders Association (RGVBA), through a presentation of their annual Parade of Homes, takes on a “cupid” role by facilitating the meeting of potential buyers with their prospective new home. 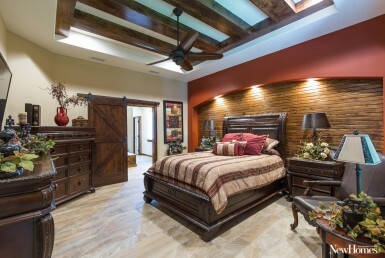 The RGVBA Parade of Homes showcases some of the Rio Grande Valley’s finest homes built by participating builder members. 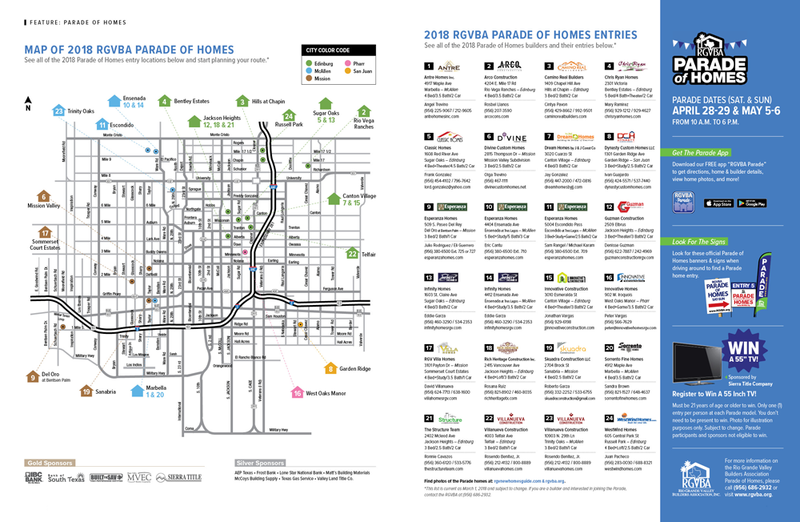 This year, the 2018 Parade of Homes will take place on April 28 & 29 and May 5 & 6. During these two weekends (Saturday and Sunday), at least 24 homes will be open to the public for viewing from 10 a.m. to 6 p.m. on these specified days. And best of all, this event is completely FREE! Parade visitors are in for a treat. They will find homes of all sizes, designs, and budgets in various communities around the upper Valley. With so many homes to tour, the online Parade Preview will help you plan your home visits better and make your home shopping more efficient. Additionally, Parade Guidebooks with specific information about each home will be available during the Parade at every location. We invite you to tour all the new homes and see some of the newest trends, designs, and materials being used. Take advantage of the opportunity to visit with the builders for a personal tour of their homes. You can also visit with mortgage lenders who will be present at many of the homes. Lastly, at every home you visit, you will be able to register for a large-screen TV to be given away at the end of the Parade to one lucky visitor. So bring the family, view all the fabulous new homes by the Valley’s leading builders, and start collecting enjoyable memories that encompass that first “fall-in-love” look at your new home! 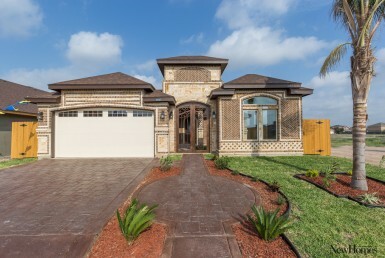 Click here to view the Parade Preview showcased in the RGV New Homes Guide magazine. 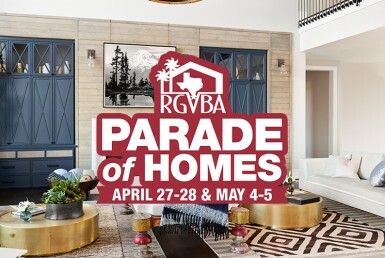 For more information on the Rio Grande Valley Builders Association Parade of Homes, please call (956) 686-2932 or visit www.rgvba.org. © 2018 RGV New Homes Guide & Across Media Marketing, LLC. Unauthorized use and/or duplication of this material without express and written permission from this site’s author and/or owner is strictly prohibited. Excerpts and links may be used, provided that full and clear credit is given to RGV New Homes Guide with appropriate and specific direction to the original content. During the last few years, Villanueva Construction has been a serious leader in building high-performance homes. For two years in a row, the company was recognized for building the most homes in the BUILT TO SAVE™ program, a high-performance home program sponsored by Magic Valley Electric Cooperative. Divine Custom Homes was once again recognized by AEP Texas for building the home with the highest kWh savings from among those entered in its High-Performance Homes Program for 2018. The award is not new to Olga Treviño, the company’s builder/owner, having received it last year, as well.